Emerging technologies and automation are deconstructing jobs, roles, and tasks. This reorganization throws organizations and workers into a destabilizing and potentially dysfunctional flux. Blockchain, Internet of Things, Data Analytics, Artificial Intelligence, and others are tossing our notion of work and workplace into the fire. Processes and organization structures will need to be continuously reconstructed in flexible, meaningful ways, keeping the best talent working on what matters most. The challenge from an organization design perspective is unprecedented. Yes, there have been automation waves in the past, but not at all levels at the same time and this speed. Now the frequency, velocity, and impact of change have never been higher, and it is accelerating. What does that mean for how we organize our work? Decisions flow through organizations, ideally based on the organization's structure and processes. The path first taken to implement automation is within the existing organizational structure. That has been going on for decades. Traditional IT systems were a step in formalizing informal and formal work structures and decision making. Over time, increasingly powerful algorithms continuously reduce the complexity of and automate decision making, while speeding it up and increasing its quality. As automation progresses, the remaining non-automated tasks and jobs will need constant reaggregation into a meaningful, productive whole. That ability to reduce decision making complexity will reduce work processes and could translate into reducing the complexity of the structure itself. 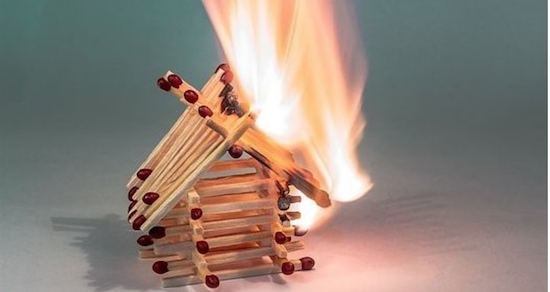 Traditional organization structures may burn to the ground. These new technologies are both arsonists and firefighters. Artificial intelligence itself may one day do organizational modeling, analysis, design, and associated process redesign and work coordination. It is realistic to expect these via algorithms, data, and continuous learning; it can create a flexible, yet complex organizational model that the future needs. In the meantime, it will be trial by fire. The implications for humans is either utopian or dystopian, depending on your point of view. Grab kindling, marshmallows, or fire hoses accordingly!